Are Apple Watches Waterproof? Here's The Truth! You are at:Home»Apple Watch»Are Apple Watches Waterproof? Here’s The Truth! Is there a difference in water-resistance between the Apple Watch Series 1, 2, and 3? Apple Watches are not waterproof, but they are water-resistant. Furthermore, the Apple Watch Series 1 has a different water-resistance rating than the Series 2 and Series 3. 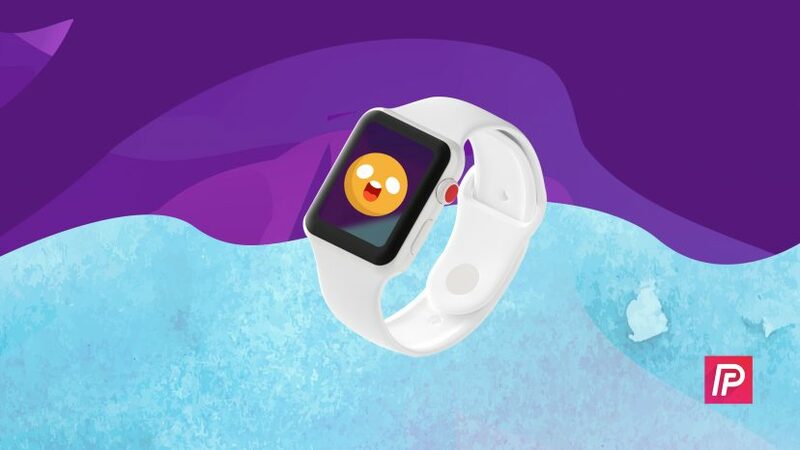 The Apple Watch Series 1 has a water-resistance rating of IPX7, meaning that it’s designed to be water-resistant while submerged up to one meter in water. The 7 in IPX7 indicates that the Apple Watch Series One received the second highest IP score for water-resistance. The highest IP score a product can receive for water-resistance is IPX8. The Apple Watch Series 2 and Series 3 both have a water-resistance rating of 50 meters under ISO Standard 22810:2010. Apple only recommends wearing your Apple Watch Series 2 or 3 while doing activities in shallow water, like swimming laps in a pool. You should avoid wearing your Apple Watch when water skiing, surfing, and scuba diving. Do I Need To Turn On Water Lock? Water Lock is a feature that was introduced for the Apple Watch Series 2 and is still integrated into the Apple Watch Series 3. It’s important to know that Water Lock doesn’t actually make your Apple Watch more water-resistant — it only locks your Apple Watch to prevent accidental taps while you’re using it around water. Note: If you start an Open Water Swim or Pool Swim workout in the Workout app, Water Lock is automatically turned on. 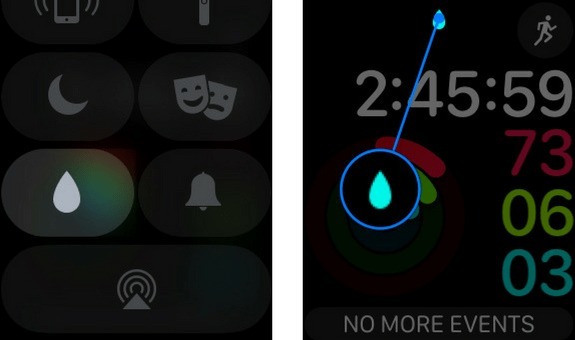 To turn on Water Lock manually, swipe up from the bottom of the watch face and tap on the water drop icon. You’ll know Water Lock is on when you see the blue water drop icon at the top of the watch face. 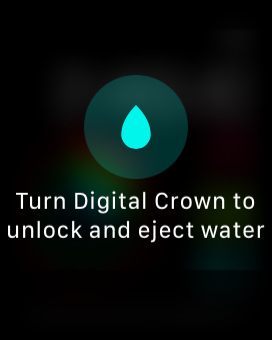 To get out of Water Lock, quickly turn the Digital Crown until the word Unlocked appears on the watch face. When you unlock your Apple Watch from Water Lock, it plays a beeping sound which expels any water still stuck in its speaker. Are Apple Watch Bands Waterproof? Some Apple Watch bands are waterproof, some are water-resistant, and some provide no protection from water at all. More often than not, a band will be water-resistant, but not waterproof. None of the Apple Watch bands you can buy directly from Apple are waterproof, but many are water-resistant. However, Apple explicitly states that the Milanese, Link Bracelet, Leather Loop, Modern Buckle, and Classic Buckle bands are not water-resistant. Be wary of third-party sellers who claim that their Apple Watch bands are waterproof. A lot of the time, their bands are water-resistant, not waterproof. If you’re thinking about buying a waterproof band, look for the band’s IP score or other water-resistance rating. If the band has an IP score of IP68 or IPX8, that means it has the highest level of water-resistance, making it almost completely waterproof. Does AppleCare Cover Water Damage To My Apple Watch? AppleCare does not directly refer to covering water damage, but it does cover your Apple Watch for two incidents of accidental damage, both of which are subject to a service fee. It’s important for you to know that water damage is not covered in AppleCare plans for iPhones, so don’t be surprised if you get quoted a large service fee from Apple. We can’t guarantee your repair will be covered, but it doesn’t hurt to bring your Apple Watch into your local Apple Store and have them take a look at it. Before you go, we recommend booking an appointment to make sure someone will be available to help you. Now that you know more about your Apple Watch, you can confidently take it to the beach or swimming pool. And when someone asks you, “Are Apple Watches waterproof?” you’ll know exactly what to tell them! If you have any other Apple Watch questions, leave them below in the comments section. Previous ArticleApple Watch Not Charging? Here’s The Real Fix! Next Article My Apple Watch Won’t Turn On! Here’s The Real Fix.